We have used this company twice now and the service has been second to none. We create our own itinerary and hire the minibus for 9 hours. Such an efficient and easy way to get around, without anyone trying to upsell you to 'their own' special activity (possibly owned by a family member :) ) I would highly recommend this company. Careful driving and polite service. Just spent the day with Mr T and Chiang Mai Minibus. 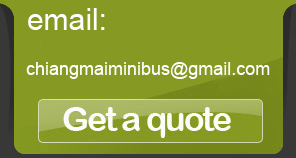 The booking service was efficient, the van is very clean and comfortable, the service was prompt, on time and Mr T's service and driving was excellent. It made our day easy and effortless and was great value for money. Great and patient customer service provided from email booking. Thank you Mr Arthid, our driver, for safe & timely ride throughout the whole 5D Chiang Mai trip. As you know, it was my parents 30th anniversary so we came to Chiang mai to celebrate. We were there for 5 days in total and booked your minibus twice. Although there has been some misunderstandings at the first instance, you immediately made a separate arrangement for us. We were happy with your prompt response and helpfulness. We were totally satisfied with the services provided by your company and our driver Mr. T deserves rewards for his smiles and thoughtfulness. Kop Kun Kap! I would like to thank you for your help in arranging for the transport and your prompt response in answering my emails. The driver, "Phan" was very patient and careful and the van was in good condition. I would like to thanks for your arrangements for the nice guy driver -Mr Ed to us. He really taken care of our safety and manageable to communicate. 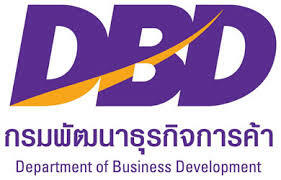 I would like to say thank you very much for your assistance during my trip to Lampang. My tour was great and everything is going smoothly. Melissa, Jake and myself would like to sincerely thank you for the service you provided during our stay in Chiang Mai. You vehicles are well maintained and extremely clean. The itinerary on offer are set up well and our driver was helpful and extremely safe. Please once again extend our thanks to Chumporn and we will reccomend your company to people we know. 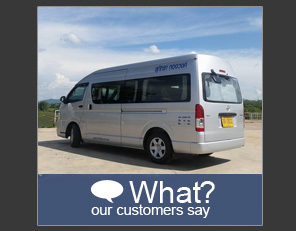 We recently used Chiang Mai Minibus for a transfer from Chiang Mai to Sukhothai. We stopped on the way to visit Wat Pratat Suthon Mongkok Kirikate and Sri Satchanalai. We were picked up in a Toyota Vios, which is a good car for a familiy of two parents and two children. The driver, was punctual, polite and helpfull. We can certainly recommend this service. Thank you for our Chiangmai arrangement, we really enjoy so much and tomorrow we are going back to singapore. Here we would like to thanks Driver Mr Jore for his good service. He really very kind cheerful, helpful with passion heart. Thank you for arranging Mr Jore to be our driver. If we have chance to visit Chiangmai again, I will contact you. Once again thank you and regards. We enjoyed your service. The car is comfortable with good driver and also excellent guide. I would recommend you to other friends. thank you for your company great service. John, the driver is great!! my friend is going to chiangmai as well, and i've recommend him to use your service. he's copied in the email. thank you! Chiang Mai tour agency offering elephant ethical tours and treks from Chiang Mai and in the North of Thailand. For privately escorted tours of Chiang Mai try Curious Gecko Tours, An animal ethical tour operator.